Handy CD Ripper Portable is a software designed for the extraction of audio track from an optical disc. It includes numerous options allowing user to adapt the copy process to its needs. Extraction: The main functionality of Handy CD Ripper Portable is to copy the song from the audio CD to the computer. The user just needs to insert the disc, select some tracks and click on the "Rip CD" button. Planning: What is interesting about this software is that it is able to perform automatically an extrac-tion when a disc is inserted. The user can personalize this process by setting some options such as choosing which tracks he wants to copy. Audio player: this Handy CD Ripper Portable's module permits to listen the content of the audio CD before launching the extraction process. The built-in audio player is easy to handle because it pro-poses only the basic options and button. 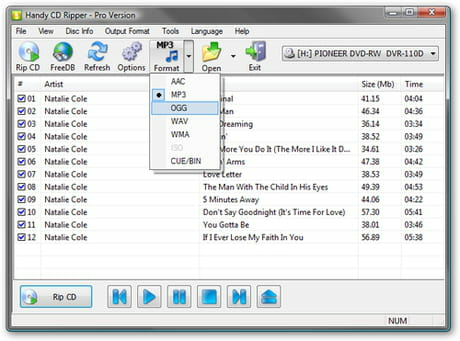 Handy CD Ripper Portable is downloadable for free. This is a portable program, so it can be run from a USB device. Latest update on May 26, 2015 at 05:27 AM.